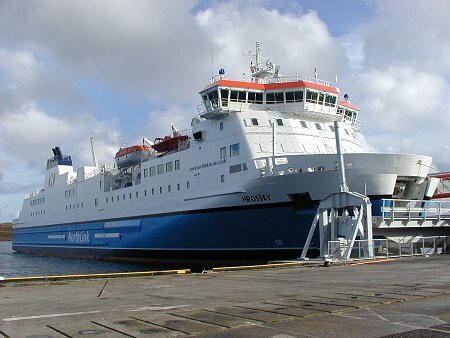 NorthLink operate two identical ships on the route from Aberdeen to the Northern Isles, the Hjaltland and the Hrossey. 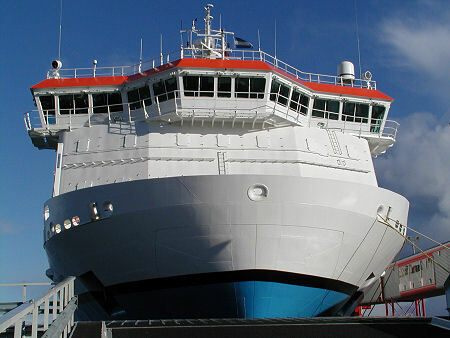 Built by the Aker shipyard in Finland, each weighs in at 12,000 tonnes and is 125m in length. 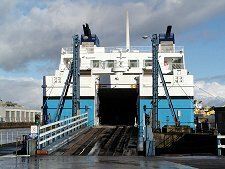 This was 25% longer than the largest ship in the Caledonian MacBrayne fleet at the time they were introduced, the Isle of Lewis. 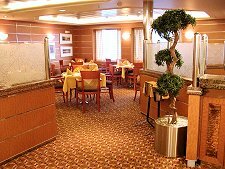 Each ship has 100 cabins, 50 outer each sleeping two, and 50 inner, each sleeping four. 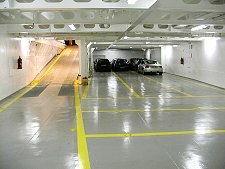 And each of the ships has a very large vehicle deck, compete with an additional car deck accessible via a hatch that raises from the floor of the main deck. 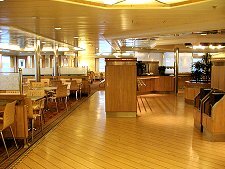 But while that looks after the business of getting passengers and their vehicles from point of departure to the point of arrival, the most impressive areas of the Hjaltland and the Hrossey are those designed to keep passengers fed and entertained on the 14-hour overnight crossings. 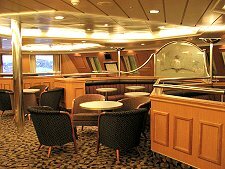 Moving from the rear to the front of the vessels these include the large and airy cafeteria, the bar, the lounge and the restaurant. Further forward there are reclining seats and a cinema, a shop, and the forward bar. All are built and finished to a very high standard. The bridges of the Hjaltland and the Hrossey are state of the art. 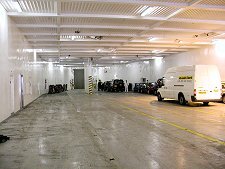 They are large and fully enclosed, including the extensions on either side that overhang the sides of the ships, and from which they can be controlled when docking. 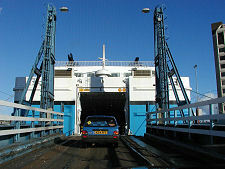 Each bridge has a range of large screens that carry information from radar and digitised charts. These show everything from where the ship is (and where other ships are) through to displays of the temperature of every part of the ship. And at the back of each bridge is a chart chest carrying old fashioned paper alternatives in case the computers ever fail. 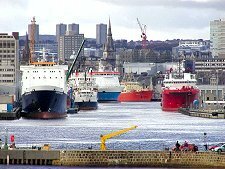 Getting into and out of Aberdeen Harbour has been described as "threading a needle" and watching the ship ease its way into the main harbour basin before heading out into the North Sea is fascinating. The route north then follows the coast past Peterhead, the distinctive gas terminal at St Fergus, and the lighthouse at Rattray Head. 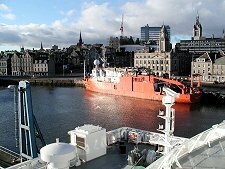 The coastline then heads west past Fraserburgh and the Kinnaird Head lighthouse, leaving your ship in open sea. Depending on the day of the week, some journeys call first at Kirkwall on Orkney, and you come into sight of the coast near Wick before passing the Duncansby Head lighthouse. Then you pass South Ronaldsay and the East Mainland of Orkney before passing Shapinsay as you sail into the Bay of Kirkwall. 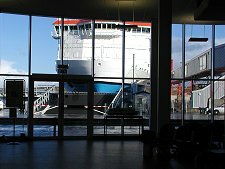 Arrival in Lerwick involves sailing up the east side of the South Mainland of Shetland after a first sighting of the Sumburgh Head lighthouse. Your ship will then pass between the island of Bressay to your right and Lerwick itself to your left, before proceeding to its terminus near the north end of the harbour. 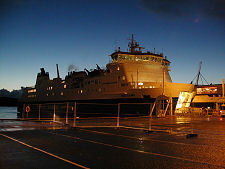 On the return trip, some sailings call at Kirkwall en route: while others proceed directly to Aberdeen.